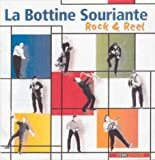 La Bottine Souriante is a folk band from Canada. The band specializes in traditional French Canadian folk music, often with a modern twist. Formed in 1976 by Yves Lambert, Andre Marchand, and Mario Forest, they have toured extensively through Europe and North America. In 1990, the band integrated a four-piece horn section with traditional instruments such as accordion, fiddle, guitar, piano and double bass, in order to add an element of jazz to their music. In 1998, they contributed a song to the Canadian Celtic music compilation by The Chieftains, Fire in the Kitchen. The group's name means "the smiling boot", which refers to the appearance of a work boot with worn-out soles.